Dozens of varieties of local fresh fruits and vegetables are on the menu at the newly opened Tessera of Brandon assisted living and memory care community in Brandon. Through a unique partnership created by the community’s management firm, Solvere Living, mostly organic products from at least six area family farms and vendors will be regularly delivered to the community so residents can enjoy fresh and local dishes year-round. To kick off this one of a kind program, the state of the art $28 million 107,000 square-foot multi-story community in Brandon, Florida, will host its first of many open to the public farmers markets. The inaugural Tessera of Brandon Tasting and Farmers Market will be held on Thursday, July 26th. Vendors will have tents and tables with sample products as well as those for purchase, with several growers also providing tutorial presentations. Tessera’s Chef Jerome Menard and his culinary team will feature partners’ ingredients in a farm-to-fork cooking demonstration and tasting from the community’s always-available menu. The center of the activities will be under a canopy of tents in Tessera’s main courtyard cooled by a system of fans, as well as in adjacent patios and surrounding grounds. There will also be live musical entertainment. Partnership farms and vendors taking part in the Farmers Market include: Tampa’s Sweetwater Organic Community Farm; Ybor City’s Brisk Coffee; Tampa’s Just Hydrate; St. Petersburg’s Working Cow Homemade; Riverview’s Wolfs Produce and Brandon’s Bloomingdale Florist. Sweetwater will showcase its wide range of herbs and also give a demonstration of Goat Yoga. Brisk Coffee, in addition to a lineup their blends and new Fair Trade line, will host coffee roasting classes. Just Hydrate will feature a selection of their juices including Tessera Hibiscus, named after the community’s Hibiscus Salon. Ice cream, sherbets and dog-friendly treats will be offered by Working Cow Homemade, and Tessera’s fruit vendor Wolfe’s Produce will share a broad range of seasonal fruits. Bloomingdale Florist will display an assortment of floral arrangements along with a tutorial. 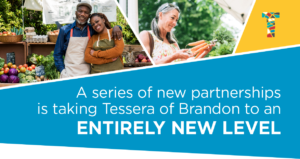 The Tessera of Brandon Tasting and Farmers Market will be held from 4-7 pm on Thursday, July 26th, at Tessera of Brandon at 1320 Oakfield Drive, Brandon, Florida 33511. Admission is free, pets are welcome and tours of the community will be provided. Space is limited; please call 813-906-1210 to make reservations. Tessera of Brandon offers 89 one- and two-bedroom assisted living apartments and 49 memory care suites in a variety of floor plans. The entire property inside and out has Wi-Fi and mobile medical technology, designed for the next generation of seniors and their families. Some of the many modern features are abundant natural light through gracious community spaces with floor-to-ceiling windows, vaulted ceiling lobby, beautifully landscaped courtyards and walking paths, gazebo, fire pit and a dog park. At the heart of their management services are Solvere Living’s proprietary wellness philosophies Salus™ and Valeo™. Salus (Latin for “well-being”) is a holistic approach that focuses on each resident’s potential to achieve his or her personal goals through engagement and connection. Valeo (Latin for “to thrive”) focuses specifically on wellness initiatives for those with memory impairments and incorporates components that examine residents’ social, intellectual, spiritual, and physical well-being. The Valeo neighborhood provides around-the-clock monitoring and support, with beautiful courtyards and wellness program specifically designed to stimulate those with dementia, Alzheimer’s and other related memory impairments. Through its team of professionals in nursing and wellness, finance, operations and marketing, Solvere Living currently manages 15 communities with three under development in nine states, including Florida, New York, New Jersey, Texas, Maryland, West Virginia, Virginia, Michigan and Oklahoma.